INVERSUS is taking stage on the east coast Saturday, September 12 at the fourth annual Boston Festival of Indie Games in Cambridge, MA. 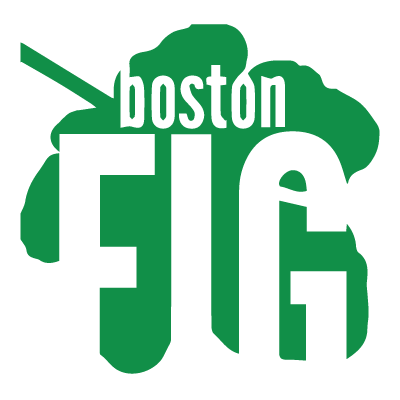 Boston FIG is primarily games local to the New England area, but having grown up in Massachusetts I should fit in just fine. I also have family there to rope into helping out at the booth! In my continued travels around the country, I’ll be stopping by Austin, TX. Fantastic Arcade is holding the first ever INVERSUS tournament on Monday, September 28. They will be showing a ton of amazing indie games so stop by, check everything out, and enter the tourney. 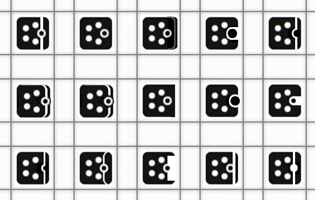 It’s time to name the INVERSUS world champion! The Penny Arcade Expo ended up being an exciting four days in the Indie MEGABOOTH. Everyone I met from fans to developers to volunteers was fantastic. The game was setup in the minibooth section of the megabooth. Being a first timer this simplified things and worked out really well. Every night brought with it some sort of event. On Friday night I actually got to show the game at the unPAXparty hosted by Unwinnable. By the final day of the show my voice was literally cracking when I talked, but it was all worth it to be a part of the group above. Thank you everyone that stopped by and played the game! 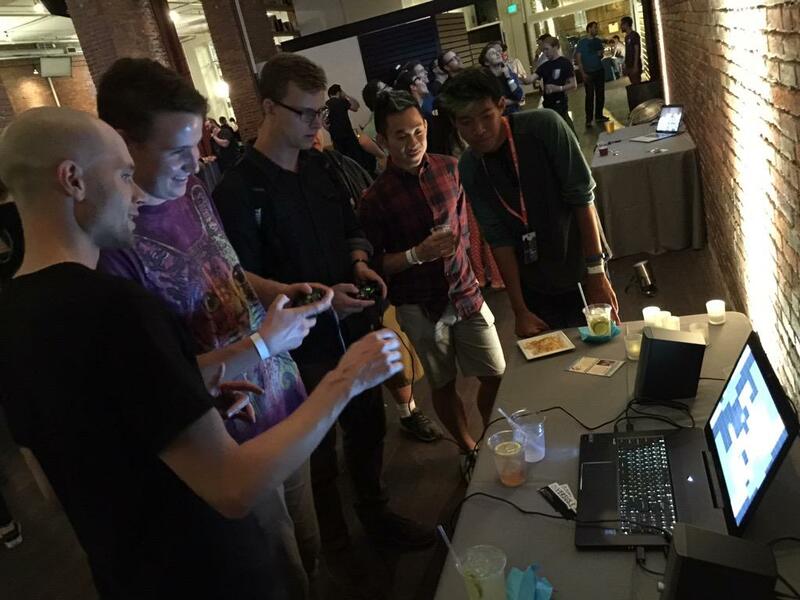 I just got back from visiting Bit Bash in Chicago where INVERSUS was on display . 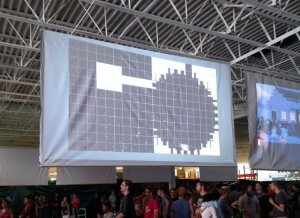 This was the both the biggest festival INVERSUS has been to and the biggest screen it has been played on. The number of attendees was in the thousands and the game was set up on this giant projection screen. 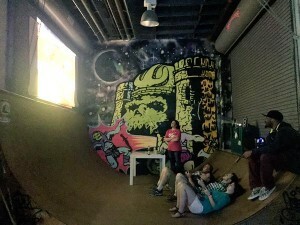 It was showing on the far side of the festival floor and attendees couldn’t see the screen when first entering the space which was unfortunate, but they could see this rad He-Man themed half pipe with Omnibus on display, and that helped draw people into view of INVERSUS. There was also plenty of room to build a line and watch the current match! Later in the night, there were a bunch of DJ sets in the center of the room to draw in a crowd and play the game under the atmosphere of a smoke machine. With Bit Bash volunteers manning the game, I got to sit back and observe. It is likely that more new people played the game there than have ever played before. I took a bunch of notes about potential improvements to add to my ever growing list; now I need to figure which, if any, to tweak before PAX next weekend. INVERSUS was greenlit on Steam yesterday! Prior to starting the greenlight process, I was rather curious about what to expect and what I should be doing. Thus, I read a bunch of postmortems about other games’ experiences in the process. 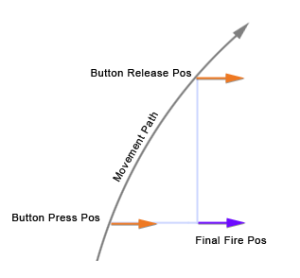 People say it is far easier than it has ever been and perhaps another postmortem isn’t of great use, but I still want to return the favor and give future devs another reference point. Prior to this, I was familiar with the concept behind Greenlight and some general DOs and DON’Ts, but I hadn’t ever really dug into the actual system and viewing games inside it. My biggest surprise was how large of a quality range you can find in the submissions. There are a number of unpolished projects and stepping out of that band is the best way to separate yourself. INVERSUS has a very minimalist art style that has had a ton of thought poured into it, but I am prepared for a segment of the mass market to have a hard time differentiating it from the plethora of blocky indie games out there. 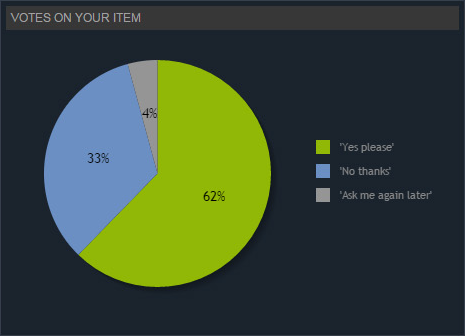 That said, on Steam Greenlight, almost 100% of my feedback was glowing. This was not due to an extensive prior community around the game and it was not due to any internet coverage. It was almost entirely due to presenting a product that showed a high level of craft. Let’s dive into how the game actually performed and then we can go over some of the parts that helped it get there and how I feel about it all. The game had 6,289 unique visits to the page. 5,288 of those visitors actually voted. 3,294 of those votes were “Yes” when presented with the question “Would you buy this game if it were available in Steam?”. This is the percentage breakdown of the voters. 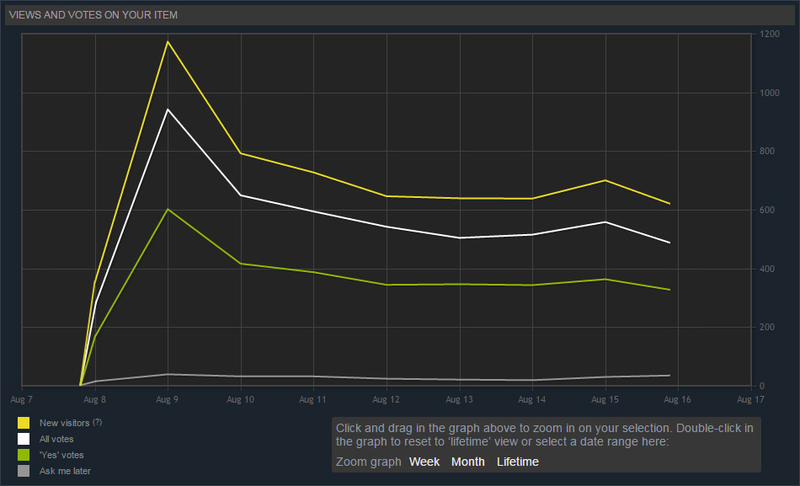 The game was greenlit in a span of eight days. 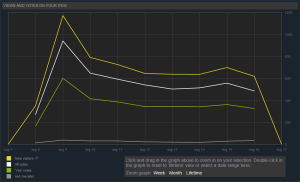 This is the graph directly from Steam. Below is a touched up version of the graph to better represent the time period the project was actually live. I flipped the switch a little before 1pm on a Sunday afternoon and got approved around 3pm on the Monday eight days later. From what I could gather the greenlight clock would actually flip days around 5pm my time (PST). The most obvious takeaway here is that you get a really large bump of views at the start. No one has rated your game yet so it will get into more queues and you are on the front page. I was also lucky enough to hold a spot on the front page for 3 whole days. This is entirely based on how many new games are getting submitted after yours. I also found it interesting that I got a bump in views on the Sunday before approval. Being curious if somewhere online was responsible for linking to the page or if it was just normal steam activity I checked in with the Google Analytics. Steam lets you link into Google’s system which is a great feature and I recommend doing it. First off, it is worth verifying that everything is working and as you can see in this similarly shaped graph from google it seems likely. 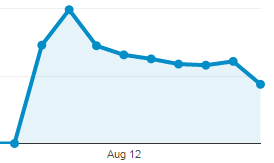 It turns out that almost all of my traffic every day came directly from within Steam. The only referrals that were even noticeable were about 100 from twitter, 50 from facebook, and 50 from a greenlight postmortem that was posted to gamasutra and referenced my page (but it was not responsible for the bump). As I’m sure you have read elsewhere, you want a good trailer and you want a good branding image. 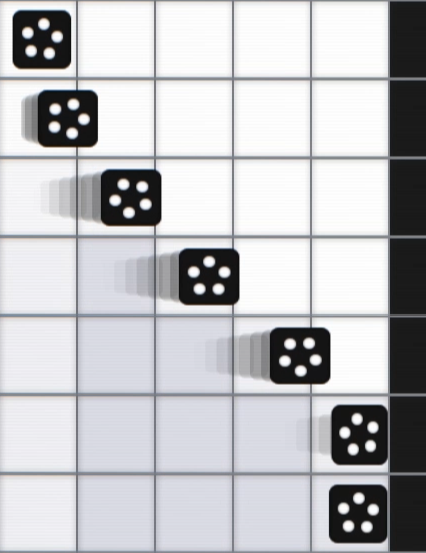 INVERSUS is built onto top of a simple yet novel mechanic and communicating how it works was my primary goal in the trailer. It starts of with a very quick “story” demonstrating how attacks are used for both spatial control and destroying the opponent. I tried to keep the focal point moving at each “chapter” to keep the viewer engaged during what is arguably a veiled tutorial. Once that is out of the way, I kick into fast cuts of actual gameplay knowing that you are better able to appreciate the mechanical complexity of a match. For the branding image, I wanted something that would catch the eye with gameplay, show competence in my ability to deliver a polished project, and entice the viewer to find out more. In a continued effort to showcase a bit of class, I used a lot of images in my description section (you can see it here) to breakup the wall of text and make it look like I had more control of the HTML layout than I actually did. I tried to model it after a subset of what is on inversusgame.com and I think it worked out well. At the end of the day, if you are making a polished game, I think you will be just fine getting through. You don’t even need to focus on advertising outside of Greenlight (although it is a good talking point). Had someone told me not to worry too much about the process, I might not have agonized over the details as much and saved myself some time and headache, but I also might not have put my best foot forward to the degree that I did. When it comes down to it, just submitting to Greenlight has put over 6000 new eyes on my game and a large number of them are looking forward to it based on what they saw. This is where you will build your initial set of followers on Steam that want to be notified when you actually release. From that viewpoint, I think all the agonizing and polish ends up well worth it even if the game could eventually slip through with less work. In a previous post about polishing the impact frames when the player slams into a wall, I mentioned wanting to make one more adjustment. The player should stretch just a hair parallel to the wall when it squishes into it. So here is a quick update showing where I’ve ended up for now. And once again, this is a lot harder to feel in a web video than it is in the actual game, but let’s give it a go regardless. Here it is in motion. And here are some static frames from the the above video. On impact, it is only a couple pixels wider, which really helps you feel the collision without making the player feel like jelly from a more exaggerated stretch. 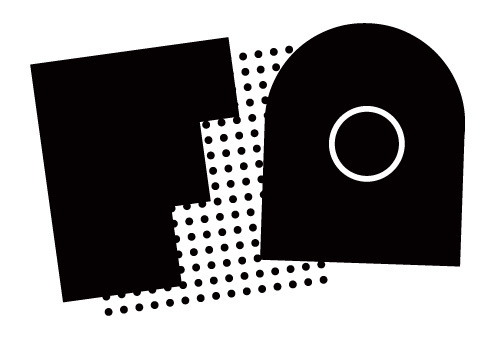 The latest edition of the INVERSUS Newsletter has hit the shelves. Click here to read the full print, or read below for the highlights. 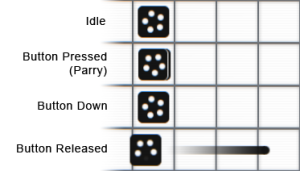 On Sunday afternoon, INVERSUS officially entered the fray of Steam Greenlight. For those unaware, Greenlight is community driven method for making a game available on the Steam marketplace. Once passing the Greenlight process, I will gain access to the Steam SDK and be able to start integrating with their ecosystem (achievements, etc). If you have a Steam account, you can go to this page to vote! So far it’s going really well. All the comments have been positive any we are (as of right now) 99% of the way to being in the top 100 games! INVERSUS is back on the road and the first stop is Chicago on August 22nd. 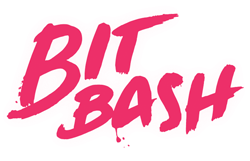 The folks who run the Bit Bash indie game festival were fans of what they saw online and will be setting up a station for the game. I’m also going to fly out and spend the day. I’ve never been to the windy city before and I think this will be a real fun excuse to visit! The event is at 1260 W Madison from 2-11PM. Here’s a rad trailer showing a bunch of the stuff you can play if you come by. 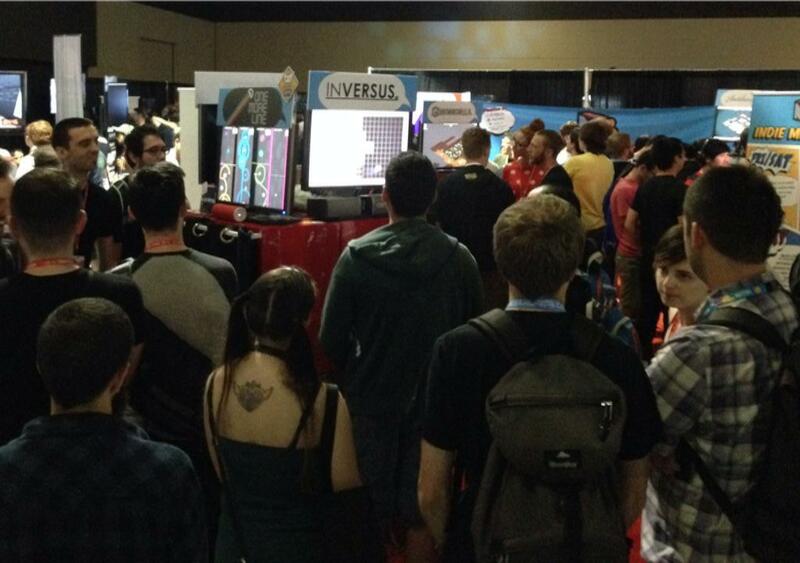 I’m thrilled to say that INVERSUS will be part of the Indie MEGABOOTH at PAX Prime this year! This is one of if not the best places to get to show an indie game to the masses and is a really big deal for getting the game out there. 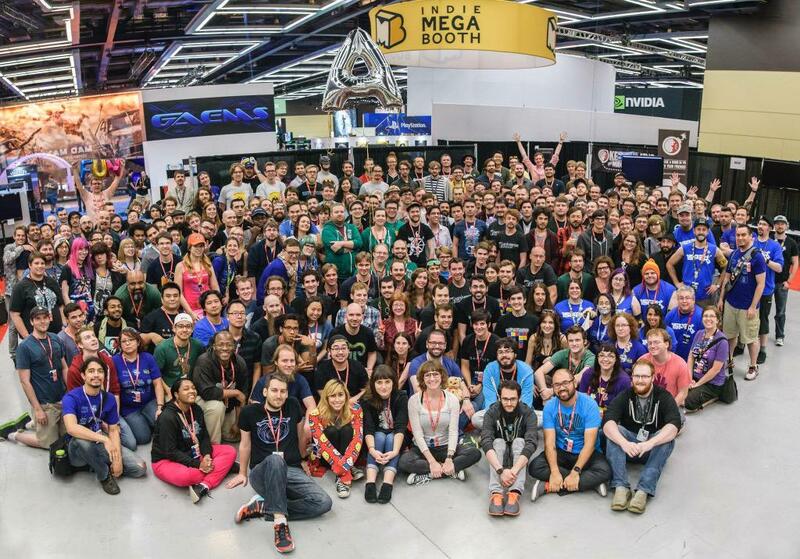 This year PAX is from August 28th – 31st at the Seattle convention center. Tickets have been sold out for a long while now so you likely know whether or not you’ll be there. Specifically, I’ll be demoing as part of the MINIBOOTH section of the larger MEGABOOTH. Just look out for the area with a bunch of kiosks instead of booths and you can find me. I’ll be there all four days. If you want to talk to me when I’m dead tired and have lost my voice, stop by on the final day. The game even got a spot in the official trailer! Adding an assortment of subtle polish items to your game is a great way to create that je ne sais quoi that leads to comments about fluidity, feel, and tight controls. Each little bit might not have a huge impact, but the summed result separates you from the crowd. Inversus has a very minimalist aesthetic and at first blush a build of the game from a year ago might be hard to distinguish from what I have now. However, what I have now looks and feels an order of magnitude better. One of the comments I often get is how smooth the game looks, but its a bit hard to pinpoint why unless you know about all the things to look for. Today I’m going to talk about the most recent one of those things. I made a new trailer last week which you can see below. The video opens up with the player bashing into a wall. This impact hadn’t received much love prior to recording so I used it as an impetus to spruce things up. When first prototyping the game, player ships would just slide around the screen as static images. Honestly, to most people that is still what it looks like they are doing, but at the same time it “feels” better. One part of that feel is the subtle application of squash and stretch. I want the ships to maintain their original rigidity. It helps sell the neo-arcade vibe and gives them strength. On the other hand, I want the screen to be very reactive to player input and movement. I want fluidity. To get this balance, I apply a hint squash and stretch. This bit of flavor has been part of player motion for around a year, but it was not part of smacking into walls until last week. Below you can see the three stages of iteration. In game, this all animates at a smooth 60fps so this isn’t a perfect 1-to-1 representation, but it gets the point across. You might want to block out two of the animations with your hands to help focus on each individually. Let’s take a look at stills from the three most important states. 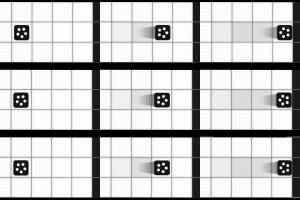 On the left you can see all three iterations have the same square stationary state. 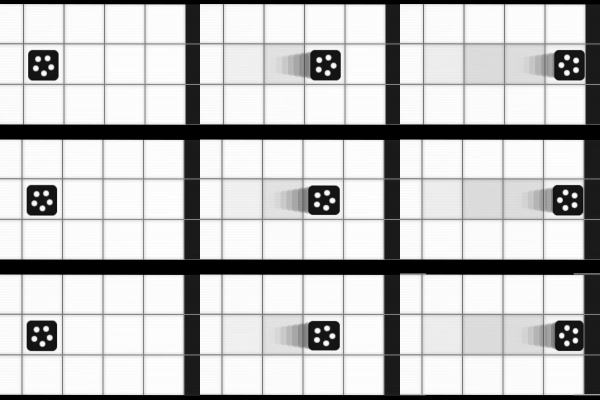 Once the player starts moving, the later two iterations stretch ever so slightly in the direction of motion and squish perpendicular to the direction of motion. The difference is on the order of a few pixels, but it really makes a difference to how your brain processes the screen. Finally, at the right bottom you can see the player ship briefly squish up against the wall. Unfortunately, it doesn’t stretch past its stationary width during the squish. Adding a couple more pixels of counter stretch here will likely make this interaction feel even a more natural and I’ll slip that in sometime this week. If you are passionate about feel and creating satisfying interactions, I suggest looking at each action of your game, no matter how small, and gracing it with with a hint of life. 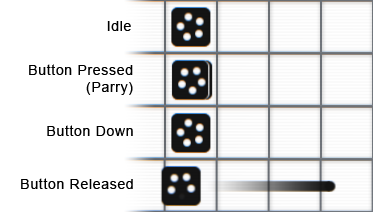 For a long time, Inversus only featured a single pickup type, the red fast bullet. Let’s talk about some new additions to the team! Picking up the smash item turns your ship red. You have a few seconds of speed boost and the ability to smash through cells on contact without spending any ammo. Feedback wise, I’ve added some subtle controller rumble on each block break. The acquisition sound is still the same as for the fast shots and might need to change. The biggest issue, however is that you don’t get any audiovisual feedback regarding how much longer the power lasts. At minimum, it needs some sort of accelerated blink over the last couple seconds. The shield pickup puts a red border around your ship. It lets you take an extra hit before losing the match. Currently the shield lasts until the rounds ends or until it breaks from being shot. This is proving to drag matches out and it also makes it less exciting for the pickup to respawn while you are still shielded. The next step is likely going to be turning it into a timed mechanic (similar to the smash pickup but longer). Hopefully, this will force some aggressive risk taking during this period of safety.